Good morning, happy Friday! How are you? How was your week? It seems like I was busy all week but who knows what I was doing! Some weeks are just like that. Yesterday was Splendid Sampler day. Did you get your Iowa block done? 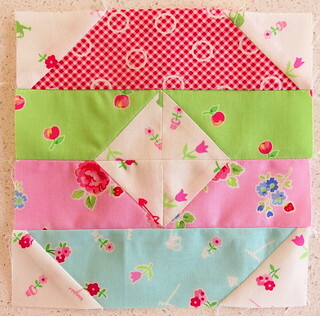 It's a quick and easy block courtesy of Sherri at A Quilting Life. Here's mine. I know I'm just a couple of blocks away from have my Quilts and More Easy Addition quilt ready to lay out, hopefully I can get to those today and start thinking about getting them sewn into rows. I'm still working on my Scrapbasket Sampler blocks, they're cute and small.. and you can see mine on Instagram. That's about it. Big plans this weekend? It's International Quilt Weekend!!! Lets get quilting!